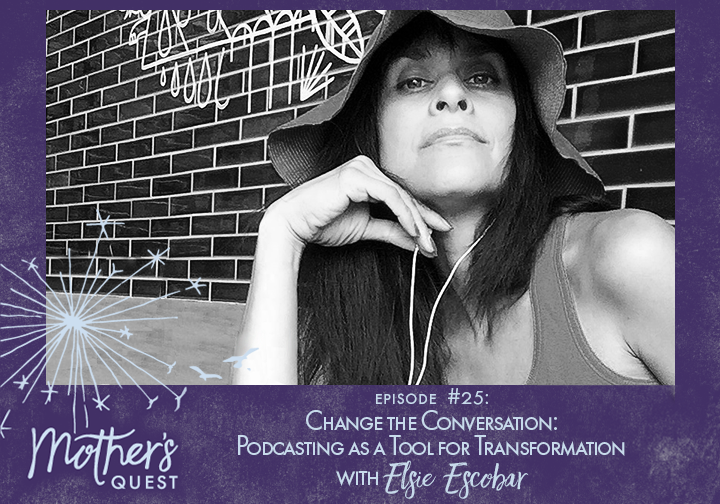 I’m excited to bring this Episode #25 of the Mother’s Quest podcast to you with a podcasting leader, mentor and community builder extraordinaire- the insightful and passionate, Elsie Escobar. A podcaster herself since 2006, at the time of this recording, Elsie is getting ready to be inducted into the Academy of Podcasters Hall of Fame at the upcoming Podcast Movement conference. Among many accomplishments, she’s being recognized for her two impactful shows about podcasting The Feed – The Official Libsyn Podcast and She Podcasts, the podcast for women about podcasting and new media from the woman’s point of view. Elsie has a lot to say about podcasting… she’s a self-proclaimed die hard podcast junkie, who especially loves to help women like myself find clarity and power in our voice and shift the narrative to focus on the things that matter most, not the numbers or downloads, but the transformative power of podcasting and expanding our podcasting audience. 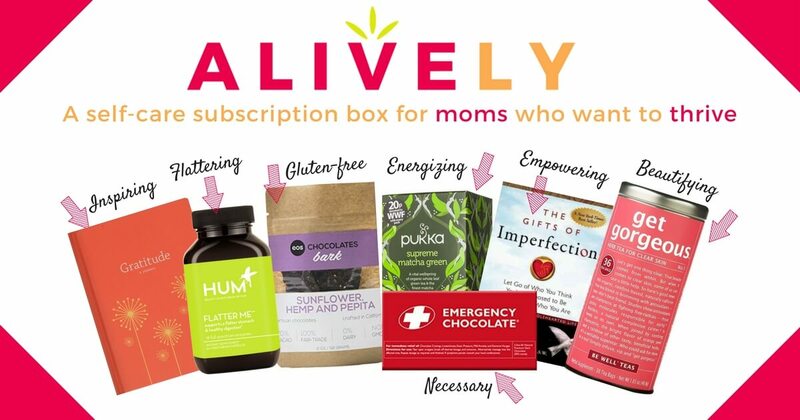 Elsie and her She Podcasts partner Jessica Kupferman have developed together an incredible Facebook group with thousands of members, many of us mothers, on a quest to bring our mission forward through podcasting while showing up fully for our children in the magic and also the mess of motherhood. Pursuing podcasting and motherhood is Elsie’s She Podcasts partner Jessica, who dedicated this week’s episode to Elsie herself and spoke about Elsie’s tremendous empathy. 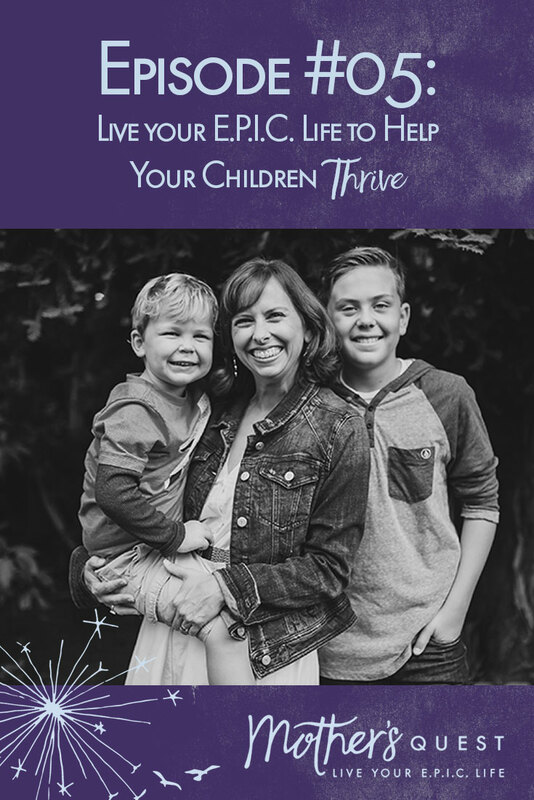 This empathic quality of Elsie’s comes through in our conversation in the way she talks about “creating space” for her children, for her passion, for dialogue that elevates and for understanding the needs and behaviors of podcast listeners. In this episode, we cover a lot of territory, from Elsie’s roots in El Salvador and how she saw her mother reinvent herself after they emigrated to the US to the power and potential of podcasting to reach the ears of those who are underrepresented and need it most. It was such an honor to have this time with Elsie, to experience her fire and passion first-hand and hear her call to amplify women’s voices, change the conversation to the things that really matter, and bring the transformative power of podcasting into our communities. Elsie gave me a personal challenge to step outside of my digital comfort zone and go to my local library to find mothers where they are and bring Mother’s Quest to them. I’m inspired to expand and stretch my voice, my impact and who I reach and welcome into my community. I hope this conversation will inspire you to do the same. Elsie gave me a personal challenge to step outside of my digital comfort zone and go to my local library, mother’s groups, or homeschooling co-ops and talk to someone in person about the Mother’s Quest Podcast. She also shares another challenge to everyone to affirm, and share something that you love. Do it until sharing what you love expands, gets to the language that matches up with us, and enables you to eloquently share things that drive you. Again, do this challenge in person, and not online. Consciously cultivating our podcast messages and giving podcast listeners “words they can repeat” and integrate into their own lives. Elsies’ upbringing in El Salvador, move to the United States when she was 9, and seeing her mother step up and reinvent herself after emigrating to the United States. “Creating space” for conversations with her children, especially when emotions are charged, and how her own partner spoke honestly with Elsie during difficult days after her children were born. Using podcasting as a venue to create a more feminine impact, looking beyond more traditional masculine metrics. How having the right business coaches has helped Elsie be everything she can be. The importance for Elsie of being true to herself and how that enables her to attract people who support her and forms her community. Q & A on the Transformative Power of Podcasting with Erica Gordon – Let’s continue this conversation inspired by Elsie’s episode with a Q & A in the Mother’s Quest Facebook Group with side business success strategist Erica Gordon of the Moms With Dreams Podcast, the week of August 13th, exact day and time TBA. 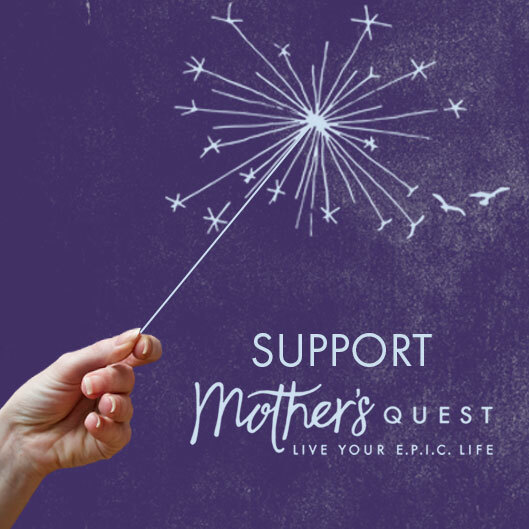 Click link to join the Mother’s Quest Facebook Group and get invited to the event. Visit the Website – If you haven’t yet visited the website, head over towww.mothersquest.com to explore some of the ways you can get more connected. At the site, you can sign up for our email list (to get show notes delivered to your inbox and our new “Mothers on a Quest” features), click the link to join the Facebook group and press record to leave a voice message for me. You can also download the FREE Live Your E.P.I.C. 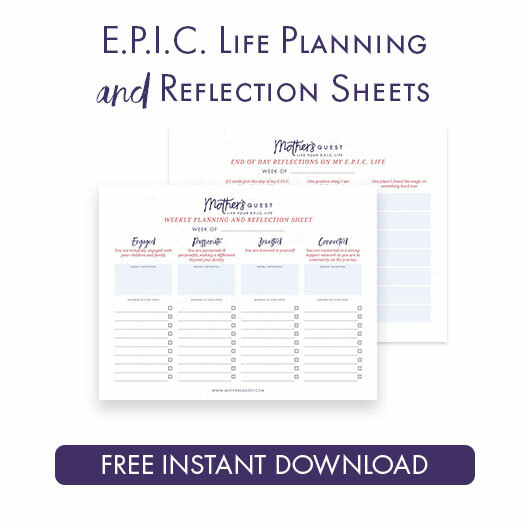 Life Planning and Reflection Sheets.